What is one "great thing" you dream of accomplishing? Do you think it will happen? Why or why not? What are some of the things that keep people from accomplishing their dreams? Give an example of a time it might be good to not accomplish your dream. Read 2 Samuel 7:1-3. How would you summarize the great thing David wanted to do for God? Even though Nathan initially agreed with David that his idea was good, God stepped in and altered the plan. Have you ever felt like you were trying to do right and people were supportive of you, yet things just weren't working out? What did you do? How can you know whether or not God wants you to do something? Read 2 Samuel 7:8-11. Make a list of all the things God had done for David, and the things He promised to do for David and Israel. Fictional CharacterCelebrity What makes this person "impressive" to you? Why do you think Samuel though Eliab was God's chosen king? (verse 6) What criteria do you think Samuel was using in his thought process? Why do you think God rejected Eliab? Verse seven says that "the LORD looks at the heart." What do you think that means? How do you feel about knowing that God is looking at your heart right now? Is he impressed with you? Why or why not? What kinds of things do not impress God? (Read Proverbs 6:16-19) Have a few people give practical examples of these things. What kind of heart does impress God? (Read Galatians 5:22-26) Have a few people give practical examples of these things. Who can start a group? ANYONE! The following are six questions to ask yourself before you start a group. Thinking through these questions will help you get started on the right foot. What will this group do? Before you invite someone to join a group, have an idea of what the primary focus of the group will be. This doesn’t have to be set in stone, nor does it need to be perfectly detailed. Likely, once the group gets going you’ll work together to figure out the specifics. It will help, though, to be able to say, “This is a group that will be focused on prayer (or Bible study, or missional service, etc…). Who will be a part of this group? Make a list of people you want to invite to join you. Or partner with a few others, and everyone invite a few people. 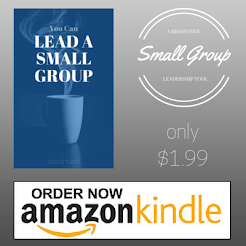 Remember, you’ll likely start small, but if you are an inviting group of people growth will happen. How will I invite people to this group? Today, I'm looking at chapter two from the book Christ's Call to Discipleship by James Montgomery Boice. This chapter is entitled, "The Call to Discipleship." Discipleship is the purpose for small groups. Different churches may use different terms, and some churches may suggest that the primary goal of small groups is something different like "community" or "fellowship", but all will agree that community and fellowship are being done for a greater purpose, and that purpose is discipleship. We want to help people be like Jesus, and that's why we do small groups.